Since the ladies have started laying, I have been tracking the number and the size of the eggs. It is nice to see both numbers increase a little each week, even though I sure don’t notice it during the week. Candidly, I am often threatening them that if they don’t provide fresh eggs I will be eating fresh meat. 🙂 Yes, it is nothing but an empty threat, but maybe it will inspire the ladies to lay a little more. I’m trying to encourage the ladies by showing them their good work. We ended up with five eggs each day for three days in a row, Friday, Saturday, and Sunday, and both Friday and Saturday the Easter Eggers outlayed the Rhode Island Reds, which is unusual. In fact, it may be the first time this has happened. The Easter Eggers consistently lay smaller eggs though, but they are getting larger. Look at the above picture again. Notice how one of the “brown” eggs is kind of pink? I am wondering if that is an Easter Egger’s egg. Supposedly they can lay pink eggs. Perhaps I have one doing just that. I’ll have to pay attention and see if I can figure out who is laying those lighter eggs. I am curious to see how the egg production begins to fall off and when this happens. I think I mentioned this last week too. 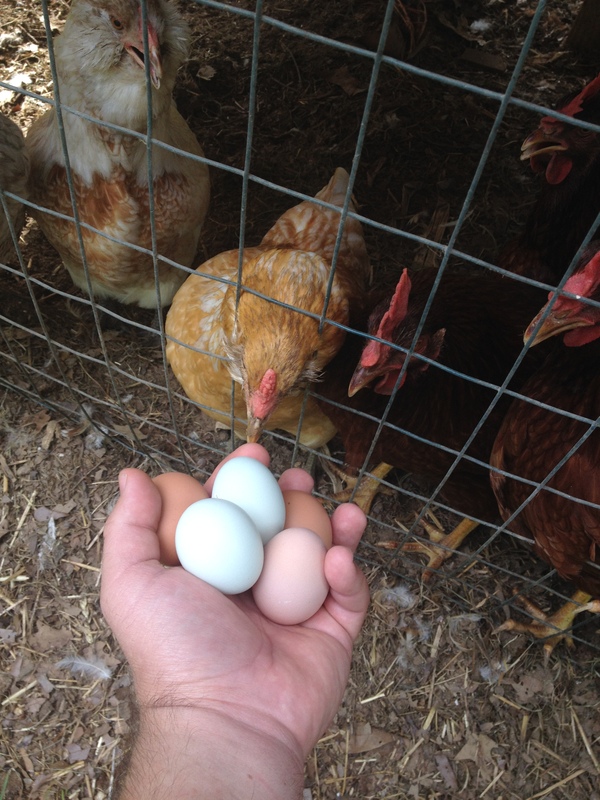 Chickens are typically light sensitive when it comes to laying eggs, though I understand the Rhode Island Reds will lay throughout the winter. We have decided we aren’t going to supplement with lights, as I think God made them to need that period of rest, which I will give them. My wife is normally the one that lets the ladies out to “stretch their wings”. She is beginning to convince me that the birds are not dumb animals as many say. Most of the time she can say something like, “Time to go back in.” over and over, and the chickens start heading for the chicken run. Of course, that doesn’t mean there aren’t a few stubborn birds, but believe it or not, there are times they all just go in. This entry was posted in Chickens, Gardening and tagged in chickens, Easter Eggers, eggs, Rhode Island Reds.